Almost 20% of UK farmers are planning to diversify in to other enterprises to support their farm business after Brexit, reveals research published today (November 7) by NFU Mutual. The leading rural insurer’s Diversification Report provides information on latest trends, together with expert insight and analysis to help farmers make decisions on the future direction of their farm businesses after Brexit. NFU Mutual surveyed farmers with established diversification businesses to gain insight into their experiences, as well as farmers currently solely involved in farming activities to understand their attitudes and plans for future diversification. The research found that from the 62%* of UK farmers who have already diversified their businesses over nine out of ten schemes (94%) have been financially successful. The important role diversification plays in the sustainability of many farms was demonstrated with nearly two thirds (63%) reporting that the income produced by diversification was ‘vital’ or ‘significant’ to their farm. The most common diversification was renewable energy (29%), followed by property letting (15%) and holiday lets (12%). Other types of popular enterprises included: livery stables (6%), Outdoor leisure activities (5%), and farm shops (2%). Not surprisingly, boosting farm income was the main reason for diversifying – quoted by 62% of farmers surveyed. Other reasons included: providing a business opportunity for a partner or other family member (26%), utilising redundant farm buildings or unproductive land (20%), and providing a short-term income (9%). While 89% of diversified farmers’ said their schemes had a positive effect on the farm business; respondents highlighted a number of challenges running an alternative enterprise alongside a farm. These include: lack of time (22%); red tape (18%); unreliable broadband (15%) and cash flow (15%). Of those farmers who had already diversified, 25% said they were planning to further develop non-farming enterprises after Brexit. Amongst farmers who do not currently run diversification enterprises, 19% said they would probably or definitely diversify in the future. However, just under half (46%) of non-diversified farms still believe farming provides the best potential for their holding. Other reasons for not planning to diversify included lack of access to finance, no interest amongst family members and poor broadband. Top choices for farmers now planning to diversify are: caravan/camping sites (27%) other holiday accommodation (20%), and renewable energy (20%). Encouragingly for the rural economy, 80% of farmers planning to diversify expect their schemes to create between one and two permanent jobs. Turning to farm business structures, NFU Mutual is concerned that less than a third of diversified farms surveyed have taken Inheritance tax implications into account in their new business plans. The insurer recommends farmers planning diversification seek expert financial advice as some types of diversification can alter the tax treatment of land and buildings. As an organisation strongly supporting initiatives to promote mental well-being in farming families, NFU Mutual also looked at rural isolation issues. Almost half (46%) of farmers surveyed thought a diversification project would make them feel less isolated than working as a farmer in an era when most work alone for long periods. 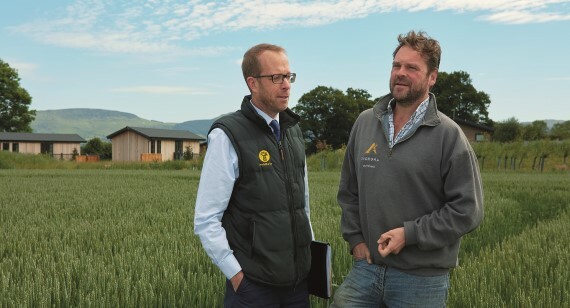 “The UK’s farmers are currently facing the greatest challenge to their future for generations, so we are working hard to help them make informed choices about the best route for their farms and families,” said Chris Walsh, NFU Mutual Farm Insurance Manager. “The basic choices farmers have available to them as direct subsidies cease are to maintain their current business models, specialise, intensify or diversify. “Every farm is different and making the right choice depends on many factors including the farm’s location, land type, family structure, financial and skills set. ”Farmers are incredibly resourceful - but for many farmers, setting up a non-farming business is a step into the unknown so our report sets out clear information on the opportunities and challenges of diversification, together with insight from existing diversifiers and industry leaders.